Just a day after the fleet leader, Discovery, landed at the nearby Shuttle Landing Facility (SLF) to end her career, the youngest orbiter of the fleet headed out to Pad 39A as the STS-134 stack on Thursday evening (7:56pm Local), arriving at the pad at 3:49am Friday. Currently the final mission for Endeavour, the 24 hour weather delay to rollout still leaves engineers with a healthy six days of contingency in the flow. It is both an emotional and exciting time for the Space Shuttle Program (SSP), as final milestones for all three vehicles are being hit at a pace. However, the mantra of “finishing strong” is being heavily epitomized by the dedication of the orbiter teams – most of whom are struggling to work out how they’ll be able to pay their mortgages later this year. Such dedication was seen in the way Discovery’s ground crews treated her return to Earth, with a highly professional turnaround, as if she was being prepared for another flight. Meanwhile, Endeavour’s team quickly turned around some minor damage on her Space Shuttle Main Engines (SSMEs), causing no delay to the stack’s rollout schedule. 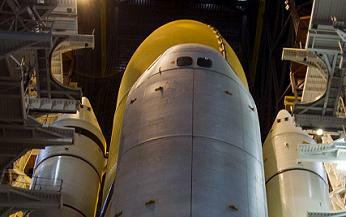 The damage occurred during the process of extending Vehicle Assembly Building (VAB) platforms to surround the vehicle, allowing for access to Endeavour’s aft, when an ELSA (Emergency Life Saving Apparatus) became dislodged from the sidewall shelf and fell to the base heat shield area near SSME 2. A dent in an MPS (Main Propulsion System) GN2 line and some damage to the PVD duct was also noted when a small platform fell on to the hardware. Thankfully, following evaluations, only the PVD duct required replacing, which was successfully carried out early this week – once engineers had taken down the aft purge which was connected to the aft of Endeavour. 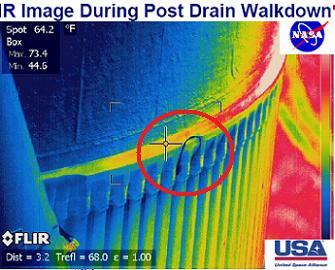 “PVD-0676: R&R (Removal and Replacement) was successfully completed with no additional damage noted to the PVD system,” noted the NASA Test Director (NTD) processing update (L2), while a double check of slight damage to a dented GN2 recirculation will be carried out at the pad via focused inspections. The progress on clearing the damaged allowed for the preparations for roll-out to Pad A to progress per normal, with the retraction of the large platforms from around Endeavour’s stack – starting with the C platform and ending with the D platform. However, unacceptable weather – relating to the small potential of lightning during the rollout – delayed STS-134’s departure from the VAB for 24 hours. Endeavour is rolling to the pad with no Interim Problem Reports (IPRs) in work, after the latest – IPR-24 – was resolved by replacing a Ground Support Equipment (GSE) cable ahead of rollout – as much as it wasn’t a constraint to the three mile trip being undertaken. A retest at the pad will be, however, carried out on two seals on Endeavour’s MPS. The Problem Report (PR) was charged against the MPS when QD (Quick Disconnect) PD 13 on LO2, and QD PD 17 on LH2 were classed as leaking. “MPS PD13 and PD17 seal change-outs are complete. Re-torques have taken place. Retest will take place at the Pad, tentatively scheduled for Saturday,” added the NTD report on Thursday. Also boosting the pad flow was the confirmation ET-122 won’t be put through a Tanking Test on its LO2/Intertank stringers, thanks to the performance of the modified ET-137 which flew without issue with Discovery. ET-122 has also been modified with the radius block modifications, so as to provide additional confidence the flange area will not suffer from the cracks seen during ET-137’s tanking for what was a scrubbed November attempt. 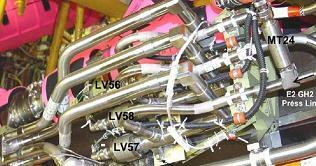 “There will be no tanking test prior to the STS-134 launch attempt,” confirmed information (L2) earlier this week. 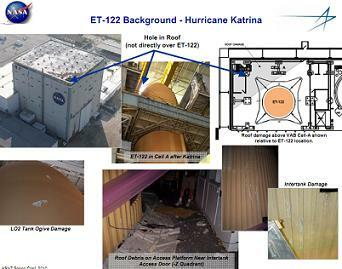 ET-122 is an older tank, repaired following damage sustained during Hurricane Katrina’s impact on the Michoud Assembly Facility (MAF), and re-manifested to the SSP. ET-138, which was to fly with Endeavour until managers decided to assign the last “new” tank to Atlantis’ STS-135 (STS-335/Launch On Need for STS-134) mission, which is also being modified, although no decision has yet taken place on if that tank will require a Tanking Test. Meanwhile, Pad 39A is already being prepared for STS-134’s launch, just a few short weeks after seeing Discovery blast off. (Numerous articles will follow. L2 members refer to STS-134 coverage sections for internal coverage, presentations, images and and updates from engineers and managers. Images used: Via L2).